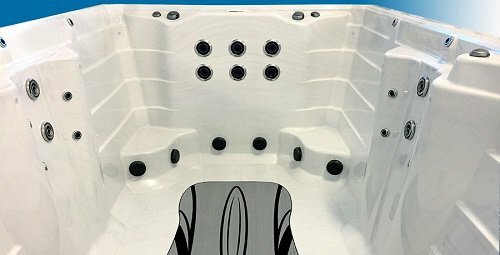 Each Synergy™ Series swim spa is equipped with six powerful Synergy Pro™ jets. These stainless steel large faced, high output swim jets create a continuous flow of water ideal for a variety of aquatic exercises, therapy and fun family activities. Swim, walk, jog or perform your favorite aquatic routine against the current for a low impact, high result workout that is energizing and effective. Increase or decrease the intensity of the jet’s water flow to change the resistance level for a gentle swim or more vigorous water exercising. Enjoy hours of fitness, fun and relaxation at home with the Synergy Pro™ Jetting. Designed to support and relieve tension in core body muscles, the RX6™ standing massage column features six strategically placed therapeutic jets from your shoulders to hips. The standing position offers massage therapy much different than seating or lounging, perfect for tight after-workout muscles. While standing, the RX6™ massage column delivers an invigorating massage to lower back, hip and abdominal muscles to naturally engage and strengthen key muscles groups. As you relax and enjoy a warm water massage, your body experiences the benefits of less muscle and joint pain, increased stability, improved posture and an overall feeling of wellness.